Last night I was enjoying the Olympics when it occurred to me…I don’t have my own Ben & Jerry’s ice cream flavor!! What?! I know! I couldn’t believe it either! 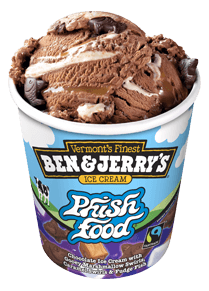 I mean, I’m not a gold medal winning Olympic Snowboarder like Hannah Teter (Maple Blondie) or a super-groovy American rock band like Phish (Phish Food), but don’t we all deserve to have a pint of gut busting deliciousness named in our honor? So I made a new goal for myself – to have a Ben & Jerry’s ice cream flavor named after me (not because I actually plan on it ever happening, but because unattainable goals can be fun to think about). And when I announced this new goal on Facebook, I got some pretty awesome suggested flavors! Here’s my plan…because these made me giggle until I snorted, I want to reward at least one person with a prize. So, in the comments tell me your favorite flavor name! Or add your own to the list! I’ll put all the names of those who participate into a random drawing for a free copy of the horror anthology Death Awaits (which I’m featured in along with Joshua Sterling Bragg from the Haunting Season and fellow Ghost Stories, Inc. member Sean Spinks who did the cover art). The book will be released by Harren Press next month (so once I get a copy, I’ll sign it and stick it in the mail for the winner)!! FYI, if any of the above ice cream names were from you on Facebook, you’re automatically entered into the drawing! Fun right?! I love contests! And I love ice cream – so this could go down as one of my favorite author-contests in the history of space and time! Can’t wait to see what ya’ all come up with! Ha ha!! I love it! Scary Berry, Screech Peach, ChillerThrillerVaniller, Bourbon Pecan Spirits, Orange/Cream Scream, BOO who?, twisty twitchy tamer (camel laced with chocolate) Ghastly Midnight Surprise (black licorice and cherries), Creepy Lychee, Java Nite Bump Thump (with expresso). Wow! You’re inner writer has been unleashed! ❤ it!